Q. 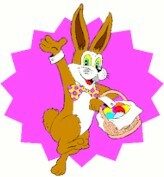 What does the Easter Rabbit get for making a basket? A. Two points just like everybody! Q. Why did the Easter Bunny hide the egg? A. Because it was a little chicken. Q. What do you call a dumb bunny? Q. What's the best way to catch a unique rabbit? A. You 'nique up on him. Q. How many hairs in a rabbit's tail? A. None, they're all on the outside. Q. How are rabbits like calculators? A. They both multiply really fast. Q. Why can't a rabbit's nose be twelve inches long? Q. How can you tell which rabbits are the oldest in a group? A. Just look for the gray hares. Q. What do you call a line of rabbits walking backwards? A. Have you ever seen a rabbit with glasses? Q. What do you get when you cross a rabbit with a boyscout? A. A boyscout who helps little old ladies hop across the street. Q. What do you get when you cross a rabbit with an elephant? A. An elephant who never forgets to eat his carrots. Q. How do you know when you're eating rabbit stew? A. When it has hares in it. Q. What do you call rabbits that live at the North Pole? Q. What do rabbits have that nothing else in the world has? Q. What is a rabbit's favorite dance? A. The Bunny Hop of course. Q. What kind of jewelry do rabbits wear? Q. What kind of book does a rabbit like at bedtime? A. One with a hoppy ending. Q. Waitress, what's this hare doing in my soup? A. Looks like the back stroke. Q. What do you cal a bunny with a dictionary in his pants? Q. What would you call the Easter Bunny if he married a chicken? A. The first Rabbit to lay and egg. Q. What do you get when you cross a bunny with a spider? Q. Why is a bunny the luckiest animal in the world? A. It has 4 rabbits' feet. Q. How do you get letter to a bunny? Q. What is the difference between a crazy bunny and a counterfeit banknote? A. One is bad money and the other is a mad bunny! Q. What do you get when you cross a bunny with an onion? Q. What does a bunny use when it goes fishing? Q. What did the bunny want to do when he grew up? A. Join the Hare Force. A. A bunny laughing its head off. Q. How do you make a rabbit stew? A. Make it wait for 3 hours! Q. Where does a bunny go when it dies? Q: What do you call a very smart bunny? Q: What do you call the Easter Bunny the Monday after Easter? A: It's been nice gnawing you. 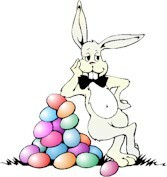 Q: Why did a fellow rabbit say that the Easter Bunny was self-centered? Q: Where does Valentine's Day comes after Easter? Q: Do you know how bunnies stay in shape? Q: What's the difference between a bunny and a lumberjack? A: One chews and hops, the other hews and chops. Q: How does the Easter Bunny say Happy Easter? Q: Why did the magician have to cancel his show? A: He'd just washed his hare and couldn't do a thing with it. Q. Why does the easter bunny have such a shiny nose? A. His powder puff's on the wrong end. Q. What do you call it when a rabbit has an accident with a knife? Q. Why do rabbits do so well at school? A. They're experts at multiplication. Q. Where do Easter Bunnies go for new tails? Q. Do you know how to find the Easter bunny if he was lost? A. Make a noise like a carrot; he'll find you. Dewey have to listen to any more ether bunny jokes? Consumption be done about all these ether bunnies? Cargo "beep, beep"...run over all the ether bunnies. Don't cry--all the Ether bunnies will be back again next year!"